Scattered across Africa, North Korean monuments celebrate the rise of independent African nation states. One example can be found in Harare, the capitol of Zimbabwe. The “National Heroes’ Acre of Zimbabwe”, is a war memorial for the heroes and heroines of Zimbabwe’s liberation struggle. Built in 1982 by North Korea, the monument is largely a copy of a similar monument in Pyongyang. The construction is therefore also a testimony to the historical relations between North Korea and Zimbabwe. 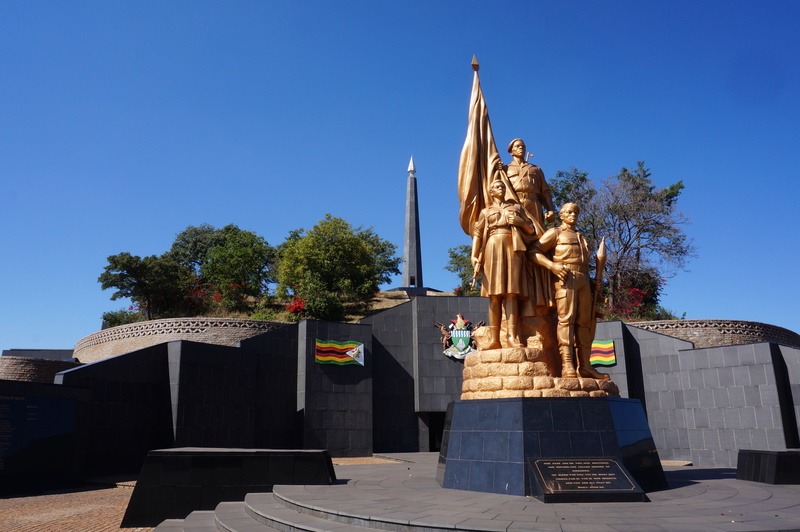 The National Heroes’ Acre of Zimbabwe consists of various elements, including around 170 graves, a tribune with enough space for 5000 spectators, the Statue of the Unknown Soldier, the Eternal Flame, a museum, and large wall murals depicting Zimbabwe’s history. Seen from the sky, the monument resembles the shape of two AK-47’s lying back to back. The monument inspired the Namibian government in 2002 to hire a North Korean company to build a similar memorial site in Windhoek, the capitol of Namibia.